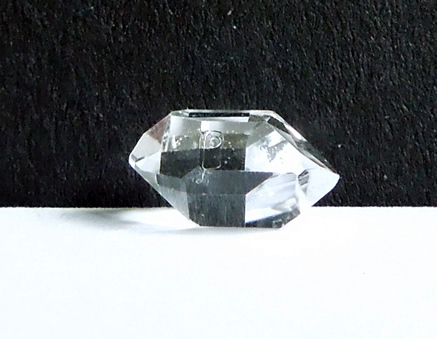 An elegant natural water clear and double terminated floater quartz crystal. 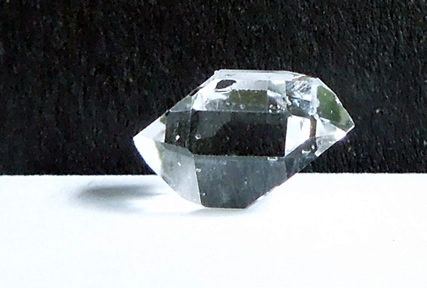 Herkimer Diamonds are considered one of the most rare of quartz crystals because of these special qualities. 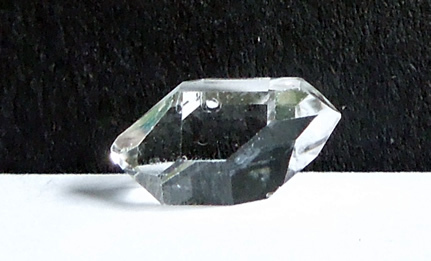 Herkimer Diamonds were formed by tremendous heat 300-500 million years ago beneath a shallow sea bed of the rock dolomite, now New York state. The dolomite began as limestone and calcite rock, and while still under water, magnesium was added. This new addition created the sedimentary rock called dolomite. Pockets and vugs within the dolomite were filled with fluid rich in silicon dioxide, or quartz, providing the material to allow the clear crystals to form. 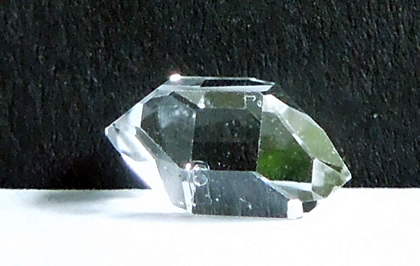 One explanation as to the double terminations points of Herkimers is that the fluid filled pockets allowed them to form freely, providing the opportunity to terminate on both ends. 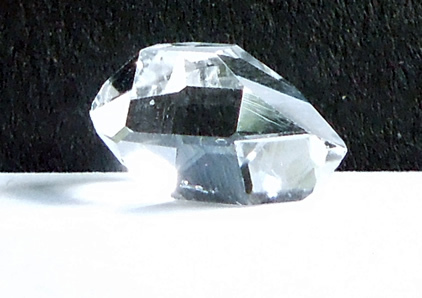 Another explanation to the double termination's is silica has no attraction to the dolomite rock and avoids attachment to it. 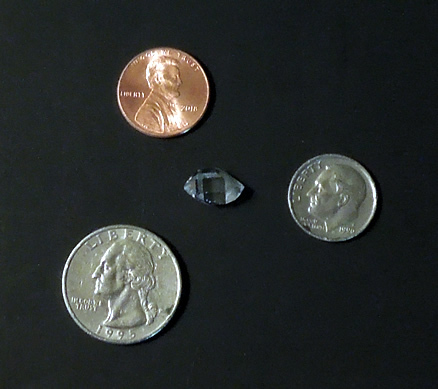 Either way, these natural quartz crystals are one of Mother Natures most beautiful creations. 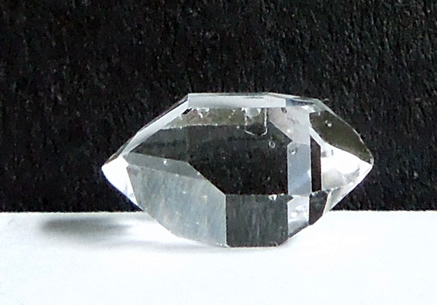 At first glance it is the sharp points, excellent clarity and elongated shape one notices. Upon closer inspection of this gem, an unusual inclusion is seen. 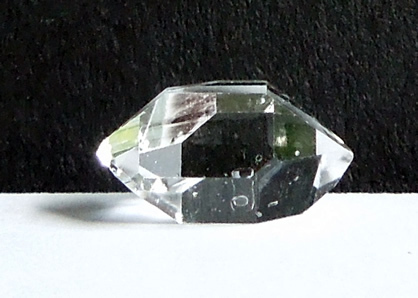 A rectangular shape with a perfectly round circle lay just beneath the surface of one of the smooth faces (facets). 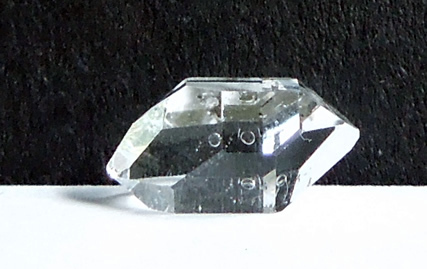 It is a flat clear inclusion that looks 3 dimensional from many angles. Many of the photographs capture it and a loupe is needed to fully appreciate it. 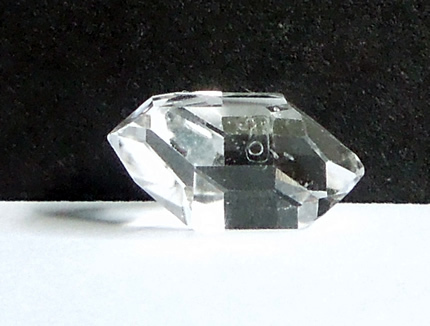 This exceptional natural double terminated water clear quartz crystal is sure to draw attention. 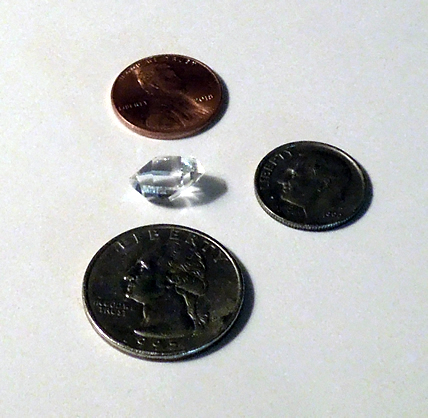 A naturally double terminated and water clear quartz crystal.